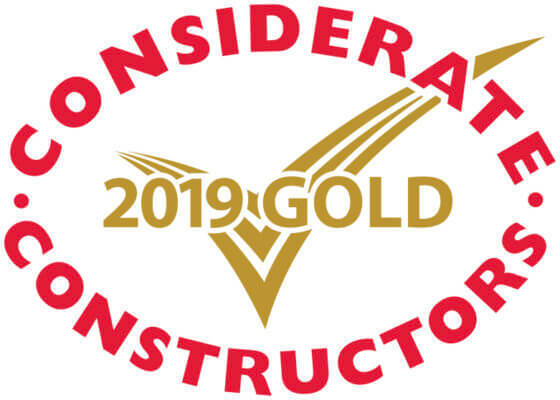 What an honour to receive Gold Considerate Constructors Scheme 2019 National Site Award for Mountpark, Baldonnell. A proud day for Irish Construction and the Dynamic Construction People. This award is real, it is not marketing, it rewards and celebrates the actual activities and culture of a site team. 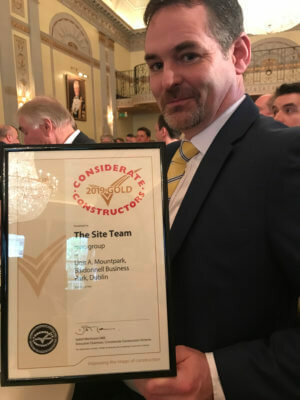 Congratulations to Gary O’Sullivan, Project Director and his team! Thank you Mountpark, our client on this logistics hub project, for their support in achieving this. Located at the original Baldonnell Business Park which was developed by SIAC in the late 1990s, the 35-acre site is home to Mountpark Baldonnell. It is the largest speculative logistics development currently under construction in Ireland. Read more about this project here. The site was audited twice by the Considerate Construction Scheme inspector. Resulting in Mountpark Baldonnell landing in the Top 5% from over 10,000 monitoring visits made to sites by the CCS in the last 12 months in Ireland and the UK. Gary O’Sullivan – Project Director. The mac team visited all of the businesses in the Baldonnell Business Park at the commencement of the project and issued monthly updates on the progress and the planned activities coming up. Communication was key to keeping our neighbours informed at all times. The project manager visited Mountpark projects in the UK to learn more about the detail and quality expectation of our client. The purpose of this visit was to look at the construction methodology used by the contractors to deliver the projects. 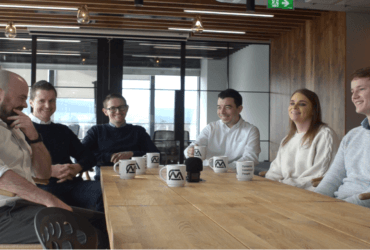 With the adverse weather conditions of rainfall and snow in the early stages of development during the intensive civil engineering package of the earthworks and soil stabilisation, mac demonstrated their commitment to excellence with their dedication and driven management team. Coupled with this the mac team sensitively managed the earthworks package in light of the extensive archaeological sites identified. With the re-sequence and acceleration of the works to ensure continuity to the programme mac can proudly say no reimbursement was sought for the costs of these delays and disruptions. mac exceeded the client expectation on the project, delivering a world class logistics facility. “ This first-class site demonstrated professionalism and consideration throughout the project. A substantial viewing platform and video feed were just two of the measures taken to keep the community updated. Community activities included school visits and charity football matches. On site, a solar panel provided some water heating. The legacy of the site included a green gym, additional planting and the creation of natural walkways and bird boxes made from recycled timber. The excellent workforce benefits included literacy and numeracy training, on-site health screening, a voluntary talk with a dietician and a weekly laundry service. 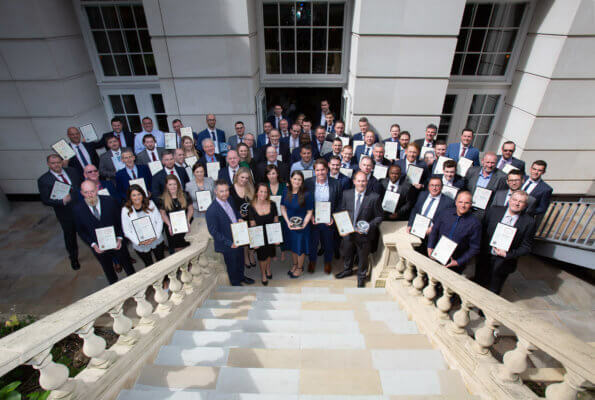 Those who reach this high level stand out from the competition with an award that demonstrates the importance they place on respecting and caring for the environment, colleagues and local communities. In summary, the practices now show exceptional outcomes across each of the Scheme categories reflecting continuous improvement with many congratulations due. 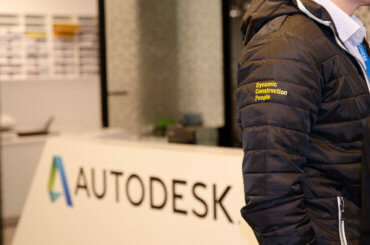 ”- Feedback from the CCS site audit team following their final visit to the project. Pictured L-R Gary O’Sullivan, Tiffany Quinn, Horst Weigel. Read more about the Mountpark project here.